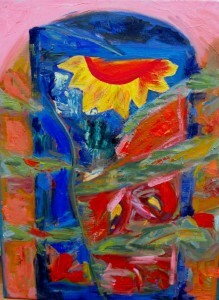 I am a visual artist who paints mainly in oil. Watercolor was my first love. I follow my whims in wild-scape gardening, down-home Southern cooking, dancing to mariachi and marimba music, interpreting astrology, and making my harmonica squawk. What you see on my canvas is a visual abstract of narratives I imagine and create. Colors and brushstrokes are primary characters in my story. How the characters arrange their appearances becomes the conversations and perceptions that convey the story. Especially, I like colors to flirt with each other.